I don’t usually post much personal stuff on here but today I feel it is needed. Sometimes writing things down makes me feel so much better but books and paper go missing. This post I know will be here forever. 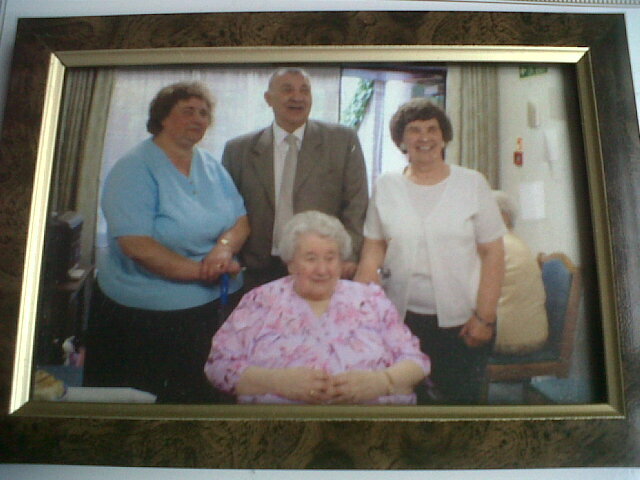 It has been 2 years to the day that my Nan passed away aged 94 years old. She had been living the last (about) 10 years of her life in a care home in Kettering. The last 5 months saw huge changes in her, in her appearance, in her health and in her quality of life. The last few months saw her bed bound and not really recognisng who we were. Just heartbreaking to see. My Nan looked after me a lot when I was little, when my parents needed to work and I used to spend most of my school holiday mornings with her and her friends who lived along her street. I have really fond memories of going in town shopping with my Nan and her Friend Betty. We would always be there way before any shops opened and end up queuing outside Woolworths and the Banks, then we would go to a day center for morning coffees and cake. There used to be about 6 ladies including my Nan who would meet up there, most of them had lost their husbands so I guess they must have come together at one point. Anyway I just remember the laughter they had, all sitting around a long table, chatting, laughter and reminiscing. I can see my Nan and Betty now laughing, smiling, being happy and enjoying the moment. Some mornings we would not go out and we would stay at my Nans house. As a child I thought this was soooo but looking back now I would give anything to have just an hour of one of those mornings. We would watch morning Television which mostly consisted of my Nans favourite quiz shows and Supermarket Sweep, Nan always knew the answers to the quiz questions 2 seconds after the answer was revealed! We always used to eat Cherry Tomatoes with lunch, this was a luxury I loved because we never had them at home so me and my Nan would happily snack through a whole pack. Shopping trips would also mean a walk to the local Co-op which was just around the corner from where Nan lived. I can see now my Nan and Betty walking along dragging their shopping trollies behind them and then rain begins to falls and they would panic and scramble to get their plastic hair covers on their heads so their perm wouldn’t get wet, this used to amuse me so much. And of course a shopping trip to the co-op always included coffee and cake in the cafe. My Nan and Betty saw this as an opportunity to fill their handbags with all the sugar sachets, milk portions they could lay their hands on, even serviettes, with a ‘just incase’ ‘you never know’ out look at when you might need them! I have fond memories of my Nan and I wish that the rest of my family could have that too. I know that she did sometimes come across as a miserable and unhappy to see you kind of person and that she did sometimes say the wrong thing, maybe without thinking first. But I can sympathise with her, she did live through a tough time in history, she had a tragedy of her own, she lost her husband unexpectedly and far too young. I just feel lucky that I had the times I did with her. What ever she was to others to me she was My Nan. This day 2 years ago it was Friday, I had finished work at 6pm and because my Mum and Dad were on holiday I had been seeing Nan at the home once a day and some even twice a day. I contemplated not going that evening and going on the Saturday instead, but something kicked in and I just drove straight there. There she was laying in her bed, I made myself know to her and sat beside her, chatting away about my day, the weather and plans for the weekend. She did not look well, her speech had gone and she could barely move so she just laid there, with such a sad expression on her face. Her breath was very rattly, I could see the struggle, I wanted to do so much for her, I wanted to comfort her. I noticed on her bedside table that a blue folder had appeared, when I opened it up the title showed “The plan of the dying person” this shocked me. They knew that something was going to happen and soon. I saw that there was a section signed by my family that if she was to begin to pass away that no attempt should be made to resuscitate her. She had no quality of life, she could no speak for herself, she could not go to the bathroom, she could not feed herself, i am sure she would of completely hated to have ended up like this. Anyway I read through the whole folder with tears streaming down my face, I was scared and worried for her. I wanted to comfort her, she must of been aware, she must of heard conversations from staff, god how awful to have to lay there hearing those discussions taking part around you and you can not pipe up with your own opinion, instead just lay and take whatever comes. I took her hand and spoke softly I wanted to say so many things to her. I told her that she would be ok, that someone would look after her up in heaven, I said that I would make sure that all of her children are ok, I told her not to worry that her daughter Janet (my mum) would be back off their holiday that night. We would all be ok and that you do what you need to do, we all love you. In my head I was making plans to come back the next day on Saturday and spend the day there with her, the last thing I wanted was for her to be alone when the time came. it was 6:45pm, it felt like I had been there hours, time just seemed to standstill. I was saying my goodbye to her and when I stood up to get my coat, I notice her shelving unit full of photos, ornaments from her house, little memories dotted on a shelf all around the corner where she could not see them. I picked out 3 of the framed photos and thought I would show them to her so she could see her family. 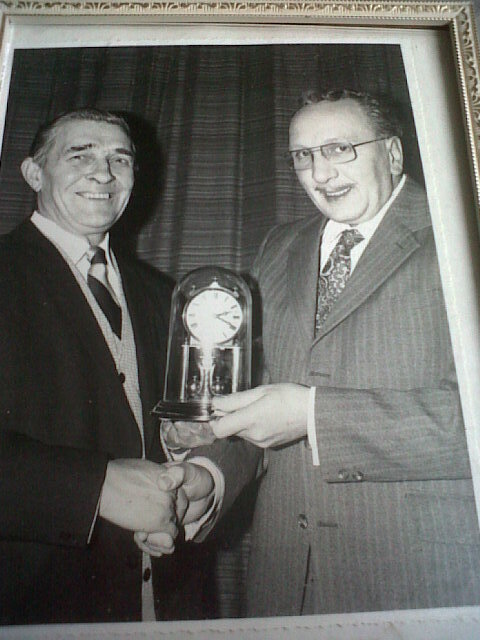 The first one was of my Grandad Ronald Richards, on his retirement day receiving his gift of a clock from his boss. I thought she would love to see her beloved. 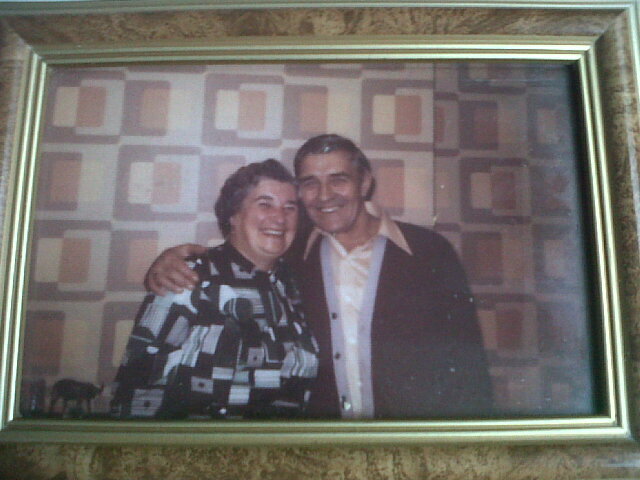 The next was a photograph of my Nan and Grandad, arms around each other, looking so happy. I think it must be of an anniversary for them. This is my favourite photo, they just look so happy together and then the last photo was of my Nan and her three children (my Mum, Aunty & Uncle) taken on her 90th birthday, 4 years previous. I could see that she focused on the photos and I held them up and spoke about them to her, hoping she understood who they were. I popped them back on the shelf and sat down again beside her. The window was open and it was a beautful spring evening, the birds were out in force outside the window and were singing their hearts out. Then 3 staff members came in. Nan suddenly jolted and her head moved, the noise of her breathing stopped. I took her soft hand. One long last breath left her body. She became silent and still, apart from a single tear which ran down her cheek. I looked on in shock, holding her hand tightly. A staff member put her hand on my shoulder, no words were needed to explain what had happened, I knew. Then the staff all left the room to notify family and I stayed with my Nan. The time was 7.15pm. I kissed her, told her I loved her, said my forever goodbye, I told her she must go and find Grandad and her friend Betty and say a big hello from me. I don’t mind admitting now that it has taken me the whole 2 years to come to terms with that evening. The first year following I really struggled.I am just so grateful to Barry who has been and still is amazing. He is all I need. I am so very glad that I was able to be there for my Nan when she needed someone the most, I hope that what I said that night had some calming effects on her and I hope she felt loved. It was a peaceful and beautiful evening and the birds sang just for her. Whatever she meant to others, what ever happened between them in the past is not a problem of mine, all I need to know is that we made some lovely memories, me and MY Nan. I would love to share the photos with you ……. Here is a poem I put together for My Nan that was read at her funeral by my Dad. you have now been blessed. our goodbye’s we must now say. they will all be together tonight. but I knew you couldn’t stay. I am now off to go and lay some flowers at the crematorium. Previous It’s Thrifty Thursday! – My AMAZING shopping trip!